I'm scared later donnie figures will have that stupid long billboard brow head. Meanwhile Blonic has Rise kids meal toys similar to a promo they had earlier this year where it was a sorta chibi figure with papercraft weapon. Found April and Donnie at Walgreens. Donnie is still there. I'll probably pickup all of the brothers too, but I want to draw out the fun a few weeks. Overall I like the April figure. She seems to be well articulated. Paint seems pretty good. Her hand grip could be a little better but gets the job done. She's a little hard to stand, but the bulk of my collection is 90's figures. She'll be in good company. It may be partly the surface I have her on too. Mayhem looks good too. Kept falling over. I put some poster tacky under him and solved that. Anyone figure out how to redeem the pizza points yet? I feel like we’ll see more about the Pizza Points once the official release date rolls around. i wonder if i should get the lair when it first comes out or wait until the under ground city comes with it. or is the city going to be separate that can be combined with the lair? for all i know they might not even release the city. decisions, decisions for layaway. Leader of the Roman Senate: All fellow members of the Roman senate hear me. Shall we continue to build palace after palace for the rich? Or shall we aspire to a more noble purpose and build decent housing for the poor? How does the senate vote? The entire Roman Senate: F*** THE POOR! Well Playmates will gauge based on sales. But ultimately it's up to the retailers and how the toys perform. If the lair is selling, better chance for what comes nexxt. I'm planning to get the lair for sure. Personally I think it's the best one yet. IF it gets released, it will be separate. There's no way they are going to make a $250+ playset. 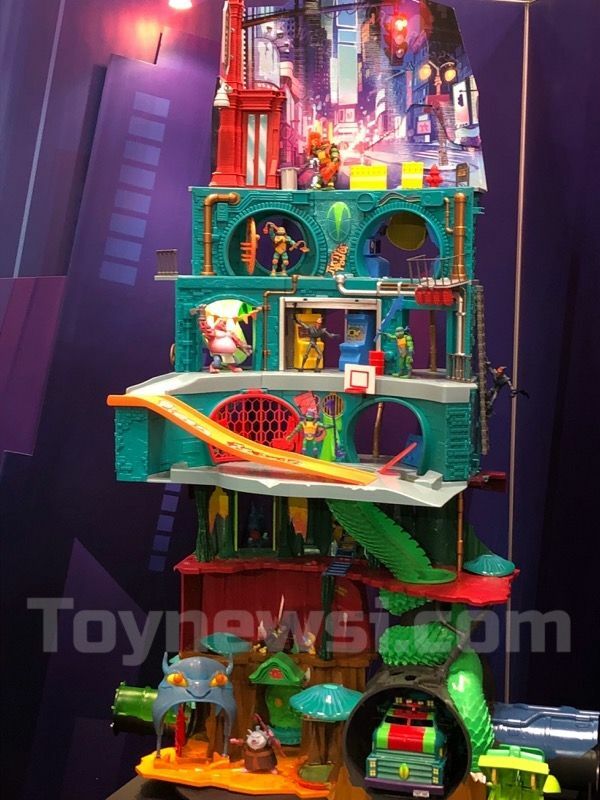 Instead they'll have two $130 playsets, or maybe it will be a little cheaper than the lair. Then you can buy one, or the other, or both -- it's up to each parent/collector. If it was a forced bundle at $250 then they would probably lose most parents, and many collectors as well. It looks like there are two versions of Meat Sweats going around. Way to go posting an image with absolutely no explanation for what is supposed to be unique about it. I compared it to the images on amazon and I don't see anything substantially different. The difference is the tendril. Only thing I can see is Canada doesn’t get pizza points? The american version has an interchangeable “baby hand” while the canada release has “tendrils” more inspired by the show. I've gotten all the basic figures released so far, save for April, I haven't seen her yet, and I didn't bother with Splinter...that's the one figure I cannot gel with at all, so I left him be. I will say I dig the figures for the most part, and the articulation on all of them are pretty decent...mind you I don't see them getting a permanent display option, but my kiddo likes them. I'm only interested in the lair playset for customizing purposes. I still haven't seen any of these toys. Granted, I only go to a few stores in general, and haven't really been looking too hard for these, but I thought I'd see them by now. I go to Target on my way home almost every day and they have zero TMNT toys out yet. I was thinking they weren't released yet. Weird. Taking a hard pass on the figures, but that lair has potential as a display piece. The Canadian Meat Sweats figure comes with a tentacle, the US version comes with a hand, not sure yet about the EU / UK releases. The Pizza Points seem to be exclusive to the US. My Walmart had em today. I almost missed them. They were on the edge of the isle just before the end. It looks like they are getting ready for a big restock. I haven't seen them around here yet, sadly. You know what? 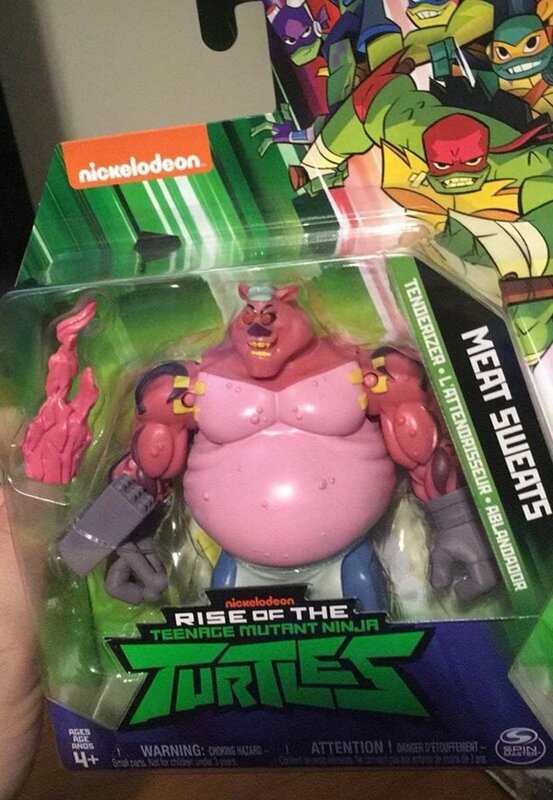 I think they need to have Raph in his hippo costume as a figure. I got all the basic figures last weekend. 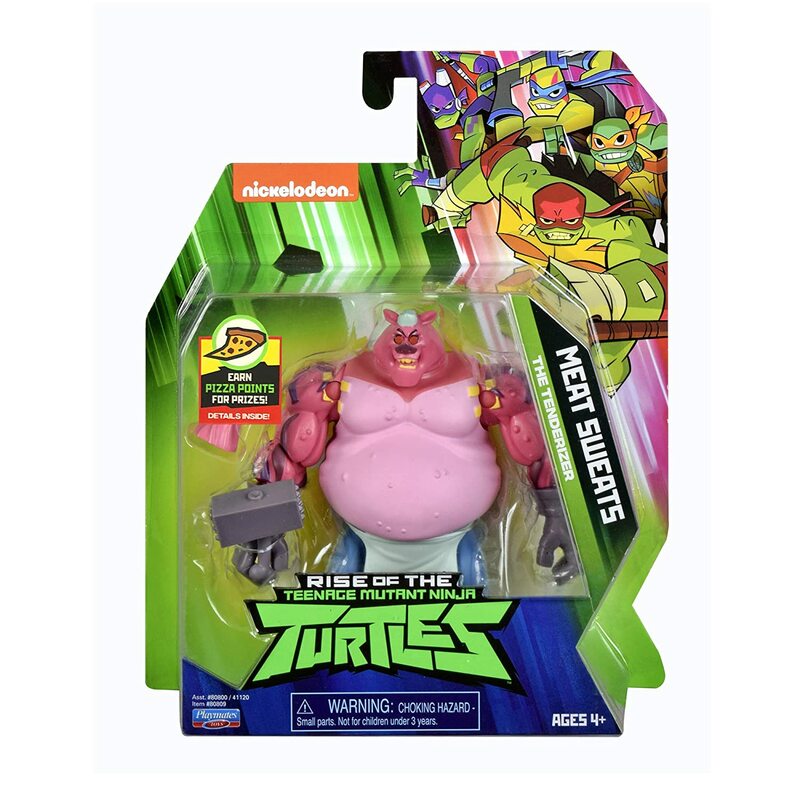 Honestly I like the turtles better in figure form than I do on the cartoon itself. My brother works at Walmart and had the toy manager pull them from the back for me before they hit shelves.